Information Regarding BOD members of Mega Bank Nepal Ltd.
News Title Information Regarding BOD members of Mega Bank Nepal Ltd.
Mega Bank Nepal Ltd. has informed NEPSE on 2075-02-03 about BOD members. For detail information please find company's letter. Tenure Extension of CEO of Butwal Power Company Ltd.
News Title Tenure Extension of CEO of Butwal Power Company Ltd.
Butwal Power Company Ltd. has informed NEPSE on 2075-02-03 that the BOD meeting of the company held in 2075-01-28 has extended the term of CEO Mr. Uttam Kumar Shrestha for next six years effective from 2075-02-01. Adjusted price for MMFDB is Rs.2518.35 for 30.80% of Bonus Share. Its Average Base Price is Rs. 2044.17. 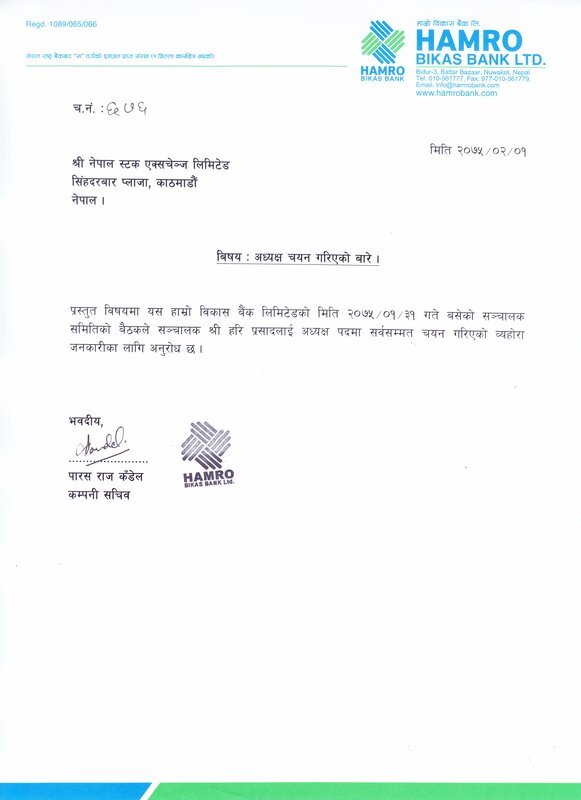 Bottlers Nepal (Balaju) Limited has informed NEPSE on 2075-02-02 about the change in director of the company. For detail information please visit our website and find the attached company letter. 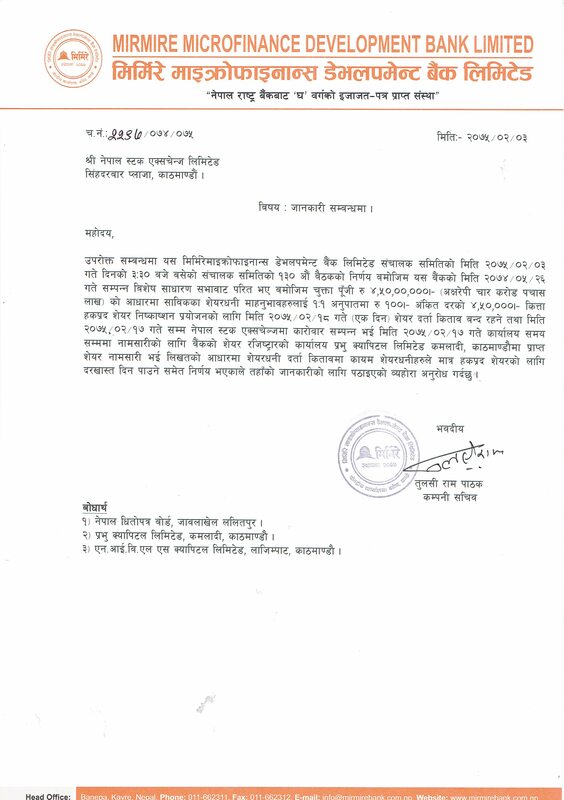 Bottlers Nepal (Terai) Limited has informed NEPSE on 2075-02-02 about the change in director of the company. For detail information please visit our website and find the attached company letter. Appointment of chairman in Prudential Insurance Co. Ltd.
News Title Appointment of chairman in Prudential Insurance Co. Ltd.
Prudential Insurance Co. Ltd.has informed NEPSE on 2075-02-02 that the 182nd BOD meeting of the company held on 2075-02-01 has appointed Mr. Shrawan Kumar Agrawal as a new chairman of the company. Appointment of BOD Member of City Express Finance Co. Ltd.
News Title Appointment of BOD Member of City Express Finance Co. Ltd.
City Express Finance Co. Ltd. has informed NEPSE on 2075-02-02 about appointment of BOD Members. For detail please find company's letter attached in our website. News Description Adjusted price for SIL is Rs.752.59 for 35% of Right Share. Its Average Base Price is Rs. 1023.80. 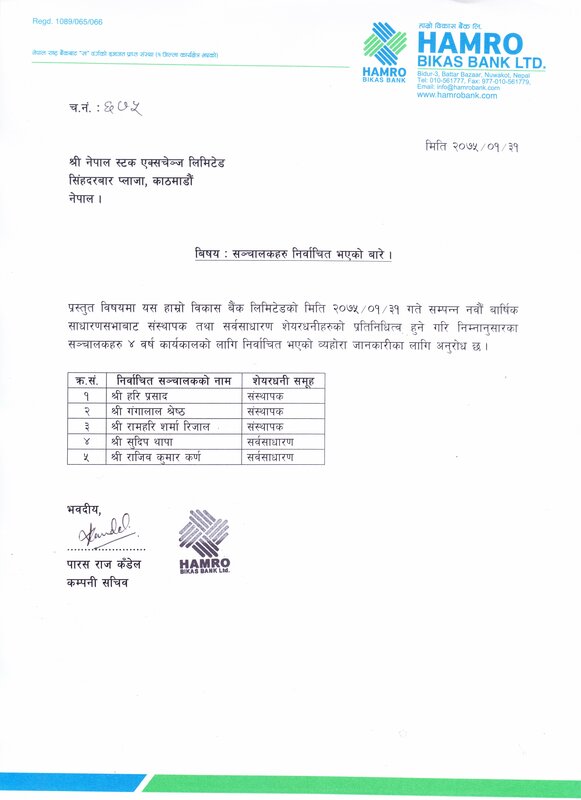 Notice regarding election of directors of Hamro Bikas Bank Ltd.
News Title Notice regarding election of directors of Hamro Bikas Bank Ltd.
Notice regarding election of directors by 9th AGM of Hamro Bikas Bank Ltd.
Notice regarding selection of Chairman of Hamro Bikas Bank Ltd.
News Title Notice regarding selection of Chairman of Hamro Bikas Bank Ltd. Adjusted price for NCDB is Rs.135.35 for 8.61% of Bonus Share. Its Average Base Price is Rs. 181.67. Book Closure of Womi Microfinance Bittiya Sanstha Ltd.
News Title Book Closure of Womi Microfinance Bittiya Sanstha Ltd.
Womi Microfinance Bittiya Sanstha Ltd. has informed Nepse on 2075-01-26 about Book Closure. For more details please find the company's letter. News Title Listing of Right Shares of Shree Investment and Finance Co. Ltd.
28,67,225.62 Units Right Shares of Shree Investment and Finance Co. Ltd. has been listed. Listing of Right Shares of Kabeli Bikash Bank Ltd.
News Title Listing of Right Shares of Kabeli Bikash Bank Ltd.
3,50,880 Units Right Shares of Kabeli Bikash Bank Ltd.has been listed. News Title Listing of Bonus Shares of Kankai Bikash Bank Ltd.
2,90,000 Units Bonus Shares of Kankai Bikash Bank Ltd. has been listed. Tenure Extension of CEO of Reliance Finance Ltd.
News Title Tenure Extension of CEO of Reliance Finance Ltd.
Reliance Finance Ltd. has informed NEPSE on 2075-01-26 that the 195th BOD meeting of the company held in 2075-01-24 has extended the term of CEO Mr. Anil Shrestha for next four years effective from 2075-01-25.